2. In a mixing bowl, beat egg whites and cream of tartar on high speed until thick, stiff peaks form, about 3-5 minutes. Set aside. 3. In another mixing bowl, combine egg yolks, cream cheese and sweetener. 5. Spoon batter into greased cupcake pans (large for bigger cream puffs; small for tiny cream puffs). 7. While rolls are still warm, loosely separate from the pans. 8. In a mixing bowl, whip heavy white cream, sweetener, peppermint extract and food coloring until still peaks form, about 3-5 minutes. Carefully pull apart or slice shells. Spoon whipped cream into shells. Place top shell and refrigerate until serving. This is such a cute sugar free, gluten free and low carbohydrate dessert recipe, and because you’re cute, too (don’t argue with me. This is my site, damn it), you deserve something fun and tiny to take the edge off of those cravings. This recipe is fine for induction, so long as you don’t eat more than a couple a day. The heavy white cream should be limited to two tablespoons per day in Atkins induction. This recipe is also a lot of fun since we’re nearing Valentine’s Day. Serve these to your sweetheart and Cupid’s arrow will strike your thinning heart! The shells are made from the batter used to make oopsie rolls. 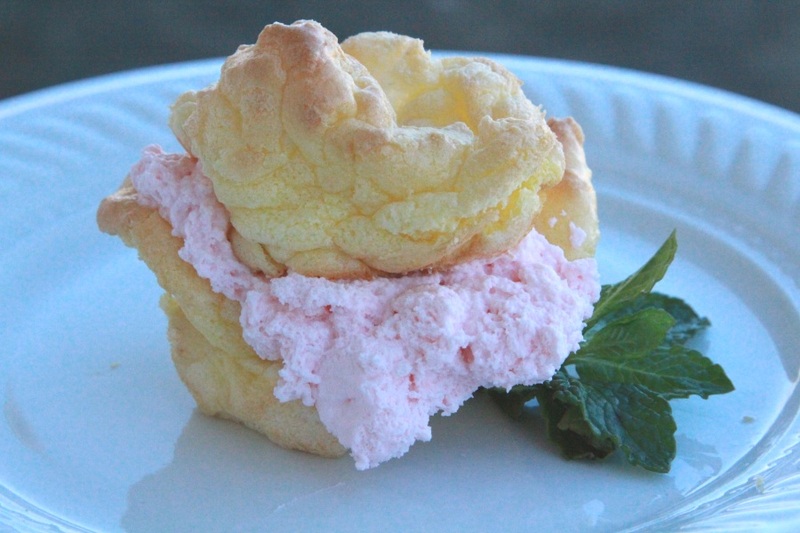 Whether you love these as standard buns or not, they make divine cream puffs! If you haven’t tried making oopsie rolls, the use of cupcake pans for this recipe ensures a perfect result. So what are you waiting for? Give these darling desserts a try and dish to tell me what you think. 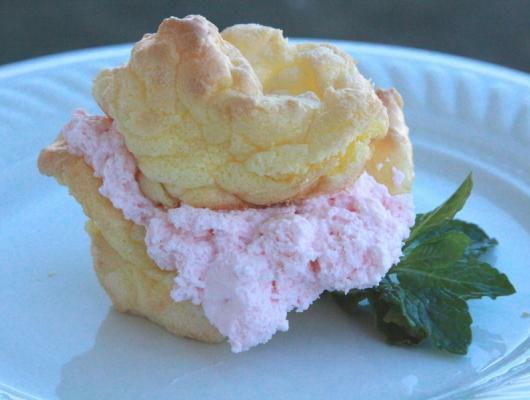 Makes 12 large cream puffs or 24 small when using one shell cut in two.